Modern businesses implement various automated processes actively. We can barely imagine a commercial sector without specific software for accounting and document flow. In the same time, sales departments use different approaches to interacting with clients as some managers track their activity on paper and others prefer Excel sheets. As a result, the whole sales process suffers from poor efficiency because employees don’t have a single, standardized, and automated system to work with customers. There is a solution called Customer Relationship Management or CRM which facilitates data gathering, performance analyzing, and generally focuses on fulfilling the consumers’ needs. Especially, this is important for banks which usually lack brand loyalty and have to pay more attention to engaging and retaining. Ideally, banks should foresee what their customers want. Hence, CRM in banking becomes essential. Let’s find out why CRM is greatly important, how it can benefit both businesses and clients, and what the best systems are. Back in the early 1970s, the idea of CRM appeared with the first annual surveys which were designed to evaluate the customers’ satisfaction. But today this strategy is universally treated with regard to software applications which automate communication with clients. The commonly-understand set of functions include sales boosting, marketing optimization, tracking key information, and analyzing results. Nonetheless, such systems (including any project on CRM in banking) can take different forms. Even paper-based history of clients’ calls is CRM if it works and helps your business. Surely, such approaches are outdated as there are dozens of modern products and providers which use different models of distribution. This vast selection of software leads to an interesting situation: each developer tries to sell its idea and its understanding of CRM which includes different sets of features or tools. Thus, several definitions appear and we offer the most general modern insight: CRM is any software which helps you successfully control and streamline the work with customers. Despite the need of CRM in banking sector, each entrepreneur defines its desires independently. Obviously, you should look for perfect systems which fulfill your needs. While small banks are happy with simple contacts’ databases, large enterprises need the full functionality with all departments integrated. So, here is a decisive idea you should remember, as for now: know what your bank needs and focus on the software which suits this demands ideally. To retain potential and existing clients. It would be distressing to neglect a customer after a strong promo campaign, wouldn’t it? CRM facilitates tracking and remembering all leads like phone calls, emails, and other requests from users. To control employees and set standards. While staff in banks without CRM handle various accounting methods like Excel or even own memory, all-in-one solutions get rid of chaos and bring everything together. Obviously, this enhances the performance. To collect data and consolidate it. Management tools establish unified databases which combine essential information like contacts and orders. With CRM, it is possible to analyze and plan the sales process more accurately. One of the benefits of CRM in banking sector includes a kind of guidelines for bank owners. If you start the first business and don’t know how to interact with clients, ready packages will be suitable. In this case, you borrow the vision of developers who rely on the best world practices and CRM standards. Nevertheless, consulting with professional development teams is the best option for new managers and chief executives. We suggest all-in-one services for all who need advanced CRM in banking. We come with comprehensive analysis, consultations, and full-stack development of custom personalized systems. Here is the question: who benefits from using CRM mostly? Surprisingly, it is both consumers and providers. Banks get a wonderful tool for control and automation while clients appreciate more personalized approach and enjoy the attitude. A good project on CRM in banking personifies services to make them unique for each client. Just take a look at two similar algorithms: in a bank without CRM and in a bank with CRM integrated. 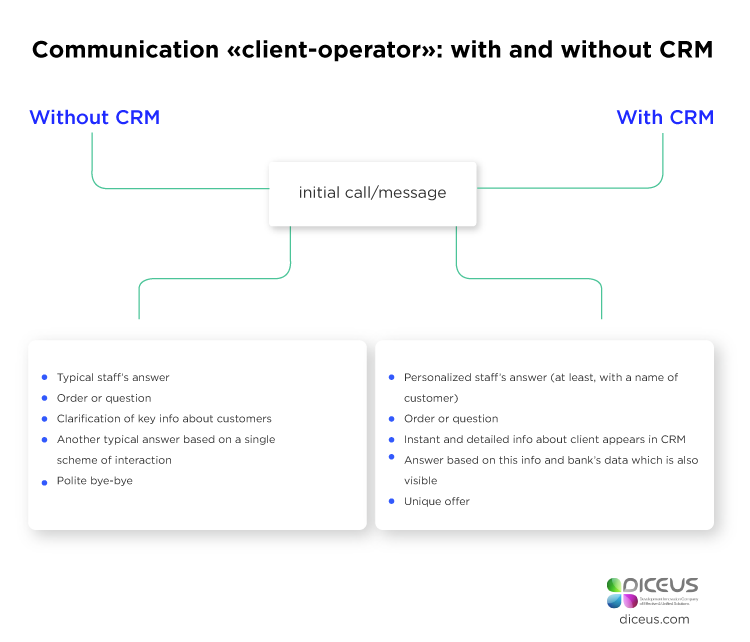 Communication «client-operator» without CRM: initial call/message – typical staff’s answer – order or question – clarification of key info about customers – another typical answer based on a single scheme of interaction – polite bye-bye. As a result, we get an unsatisfied client with decreased loyalty, most likely. Communication «client-operator» without CRM: initial call/message – personalized staff’s answer (at least, with a name of customer) – order or question – instant and detailed info about client appears in CRM – answer based on this info and bank’s data which is also visible – unique offer. Thus, the client feels that the bank focuses on his/her comfort. As we found what CRM is and why it is beneficial for banks, let’s move to examples of software. When it comes to choosing the product, you will face the question of what is better for the business. Developers distribute their software as ready-made applications or as a service on creating the app you exactly need. Eventually, it comes to your purposes. Some businesses realize the importance of CRM in banking but they are happy with standard tools while other companies require tailored stuff for unusual needs. Ordering such a system is similar to getting a standard sandwich in SubWay. You contact developers and pay for their CRM which is the same for all buyers. Usually, you can change nothing and have to adopt exactly what you receive. 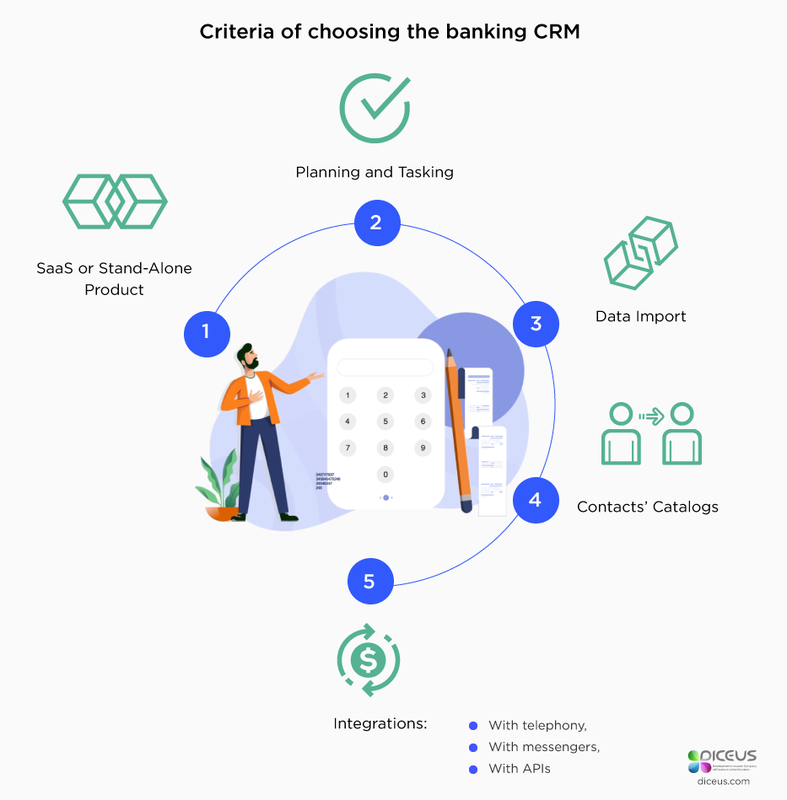 A ready-made project on CRM in banking represents a set of the most general features required by the industry-related customers (say, accounting software or telephony), so be sure to check tools provided and think how they suit your business. Common products are for: typical banks without specific purposes. Instead, cooperating with a development company which creates CRM specifically for your bank is similar to building your own beloved sandwich. Tailor-made solutions are cool when you need a lot of tools or, oppositely, don’t want to overpay for unnecessary features. Custom CRM in banking is designed for each client, so you can specify everything to be sure that the final software application will fit. As well, personalized products are cost-efficient as they don’t have monthly or annual fees and expensive upgrades. Unique solutions are for: unusually small/large banks or ones with extraordinary tasks. First and foremost, even before reviewing offers from CRM providers, make a list of your bank’s preferences. The catch is in the wide collection of different programs, so it’s easy to get lost. The general importance of CRM in banking is undeniable but your own wishes are more important because they define the final choice. For example, if you notify clients via mobile phones, you will need integration with SMS services and messengers. Also, if you work with both individuals and entities, an advanced contacts’ catalog is desirable. Overall, you can take a look at examples of modern CRM in banking to choose a product. The listed projects and providers are trusted and reviewed by users but they come as out-of-the-box solutions, mostly. As we revealed earlier, a lot of banks with unusual tasks are interested in custom solutions developed for their requirements exclusively, so also check teams which design unique CRM for each customer (we do this, to note). Regardless of the chosen type, it will be useful to know major criteria and decisive features of CRM. Software-as-as-Service (SaaS). These apps are hosted by their providers via cloud-based services. All software and data are on the developers’ servers and you get online access through a browser, desktop program or mobile application. Benefits of CRM in banking sector include simplicity and no need in free space but financial organizations should remember that all info will be controlled by a provider, not a bank. Stand-alone. Unlike SaaS, these products are fully managed by your employees. Stand-alone CRM is a licensed program or a set of programs which must be placed on your server to start working. For total control, you pay with more resources needed to maintain such a system. Usually, stand-alone products don’t feature extra fees as they and SaaS can charge payments for backups or other operations. Furthermore, stand-alone solutions differ by licensing type as there are proprietary and open source ones. Programs of the first type don’t allow users to modify the code, so you will have to adopt exactly what you received. Open source CRM in banking can be customized significantly but you will need to know how to code or have dedicated experts. Obviously, all SaaS products are proprietary. Remember our examples of «client-operator» communication with and without CRM? There, the final point of interaction is a unique offer for a customer. To be honest, these offers can start dialogues when you want to deliver information about new credit cards or deposits. Anyway, often it happens that clients don’t want to discuss this info because they are busy, so a bank clerk has no choice but to hang up. But wait. There’s another way if you realize the need of CRM in banking sector and pay attention to this feature. With the app deployed, your worker will check its schedule, ask about client’s wishes, and propose to call back later. Then, he marks this in CRM and can be sure that the system will notify about the task. With CRM, employees can interact with each other more efficiently and managers can track this activity and make plans. A really good modern project on CRM in banking also automates processes. Let’s say, a new lead appeared, so you should contact him and propose your bank’s services. A human can simply forget to do this but automated CRM will create a task to call or mail a new potential client. Also, such systems can set and close regular assignments like quarterly reports. Another important point which is widely underestimated is the initial launch of CRM linked with the data import. Most likely, you will use CRM after another managerial system or set of systems used by the bank’s departments. According to the major idea of simplicity and integration, all information must be collected and standardized by this new product. Ideally, CRM in banking should gather everything automatically using its built-in import module. Besides, all products support manual input of contacts, clients’ data, and other valuable things. We doubt that you want to do it because it’s extremely long and inconvenient. That’s why quick and simple process of data import is highly desirable for any CRM, especially, for ones which will be used in banks with large customer’s databases. Continuing the idea of convenience and different scales, it’s essential to know your customers. Banks which work with individuals only don’t need too complex catalogs and storages as they work with one level – clients. Large enterprises which serve both persons and entities should look for more benefits of CRM in banking sector like advanced databases with several levels. For instance, the first layer which features individual clients must be linked with the upper part which unites these persons in companies, so your employees and apps will know whom they are interacting with. With telephony. Allows tracking info about calls and getting a customer’s personal data right during the dialogue. With messengers. Supports automatic mass and personal mailings via SMS or various message systems. With APIs. Varies a lot as may include connections with websites, accounting software, data storages, and so on. Exact integrations depend on what you need. With custom solutions, it’s easy to discuss and specify everything. Cost of support and maintenance. In addition, there are indirect costs and expenses. Say, you will face certain problems during the deployment period as employees will need some time to get familiar with the new system. Thus, the overall efficiency of your team will be lower. Clerks and managers also will spend more time on controlling and overseeing the process instead of focusing on clients. The importance of CRM in baking is strictly related to the importance of correct payment plan choosing. There are ready-made solutions for which you have to pay monthly or annually. They feature different packages with more tools for higher cost, so you have some freedom to choose the most suitable stuff. There are also projects with a fixed price, so you can purchase a lifetime license. Both of these examples are distributed per user. 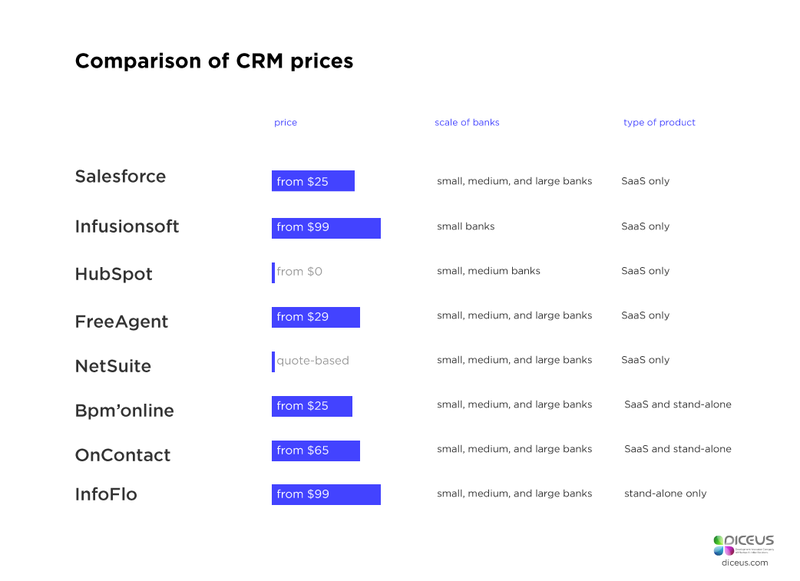 Salesforce – from $25; small, medium, and large banks; SaaS only. Infusionsoft – from $99, small banks; SaaS only. HubSpot – from $0, small and medium banks, SaaS only. FreeAgent – from $29; small, medium, and large banks; SaaS only. NetSuite – quote-based, small and medium banks, SaaS only. bpm’online – from $25; small, medium, and large banks; SaaS and stand-alone. OnContact – from $65; small, medium, and large banks; SaaS and stand-alone. InfoFlo – from $99; small, medium, and large banks; stand-alone only. But there is another pricing type called «quote-based». It stands for customizable systems developed specifically under your and your bank’s needs. Hence, such CRM will be suitable for any business because you can discuss each feature separately. Our company works according to this scheme and offers tailor-made solutions for banks of different scales. We can create the project on CRM in banking, deploy, customize, and support it. Just conclude your wishes and tell them to our developers. To learn more anout custom CRM, check the related article. Summarizing it, we clearly see that CRM is an extremely powerful tool for any business as it facilitates workflow and boosts the company performance. Benefits of CRM in banking include full integration of processes and departments, so any operator can work with any client and deliver the best personified experience. Another important thing you should remember about CRM is the ability of such systems to meet any of your requirements. Respectively, you should cooperate with providers who offer the products with the most desirable set of features. If you’re interested in solutions for the banking industry, just hit the «Contact Us» button, and we will provide a free consultation. Further, we can help you to define the needs of your business by providing a full business analysis.